A Game of Chess, this Life. 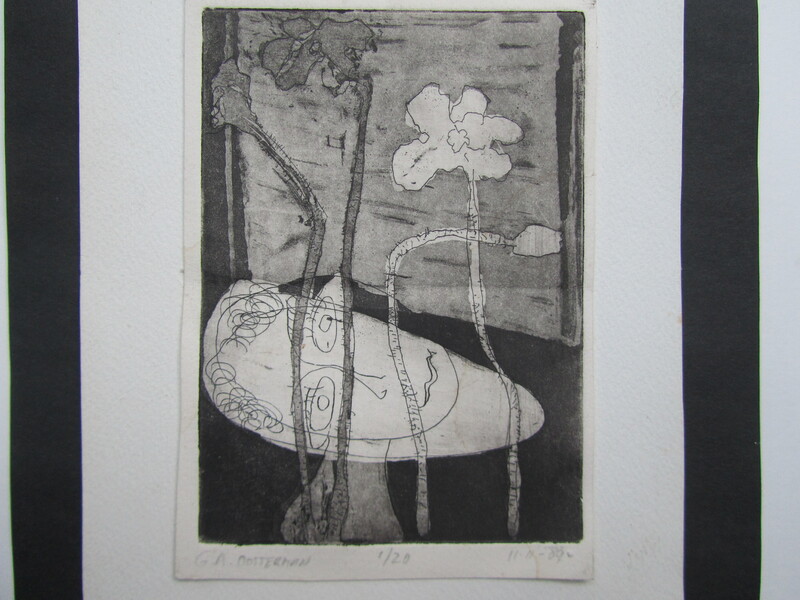 The first photo is another etching I did while gaining a certificate in printmaking. This included also a term in life-drawing at Tech. I remember a male model who I and other students observed, while feverishly drawing the charcoal over the butcher paper, he had something silvery glistening in the general lower region of his matrimonial device. It turned out after a discussion with all the students during a break, we all agreed he must have had the urge to decorate same with not just one but two rings. Two rings! All to our own. But who would see this jewellery? I suppose he would not be walking around George Street with his jeans on. 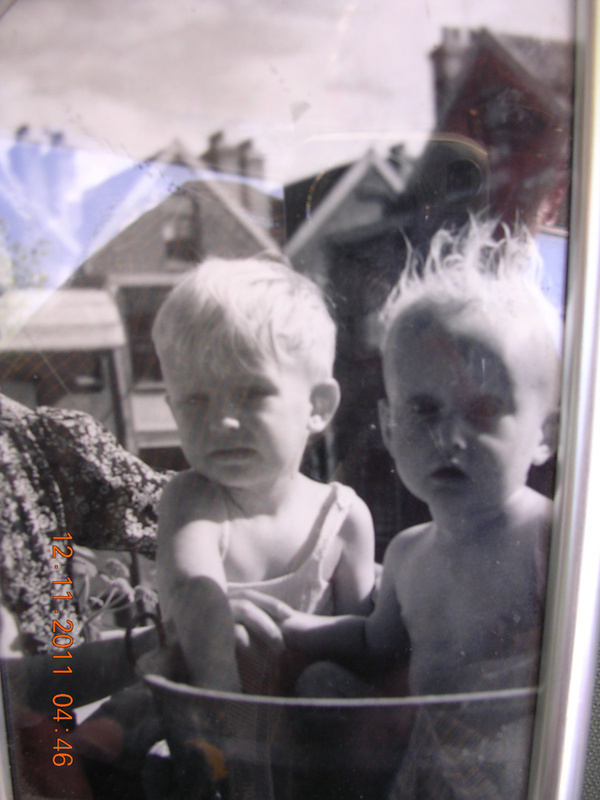 The next photo is me and brother Frank being tubbed by my mother. It would have been around 1942 when Rotterdam had been bombed but we still had a roof over our head. Dad would provide light during the evening by riding his bike in kitchen while on a stand. The dynamo (Generator) on the rear wheel would give electricity to the bicycle light which was trained on my mother’s kerosene pump up single cooker. I am the one with my hair sticking up looking a bit bewildered already. My mum is smartly dressed and looks fully absorbed in bathing her two boys with love and joy. Later on that same galvanised steel tub was where all five of us boys would tub in after we moved to The Hague. One at the time. Frank first and then me and so on. The last one probably came out worst. The water cold and a bit less than pristine with a good chance of him still remaining in a dubious state of cleanliness. 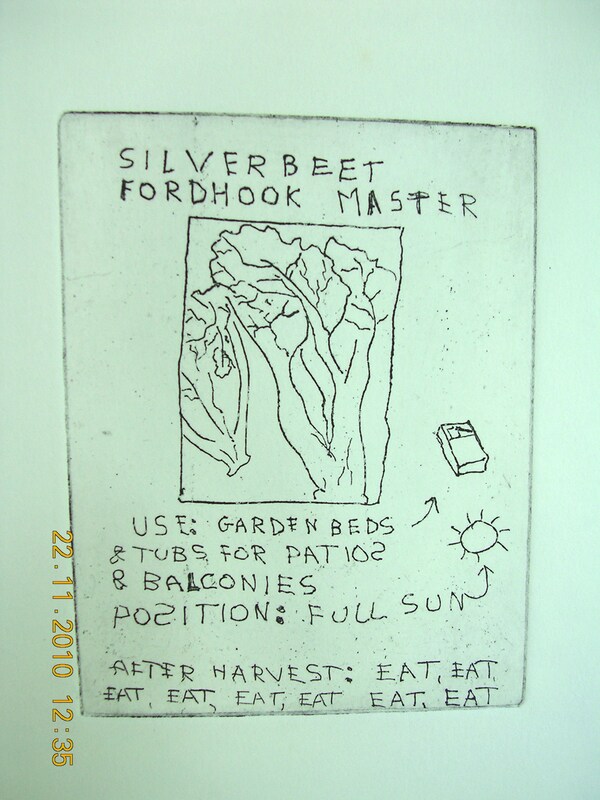 This etching above is on the Ford hook Silverbeet. I don’t remember anymore the urgent creative need for getting into vegetables etchings. Perhaps latent memories of the war or hunger! I was also practising reverse writing which you have to do when printing as one gets the reverse of what you scribed on the copper plate. Can be tricky. Have you ever read the direction on those punnets of vegetables or flowering annuals? They are sometimes very authoritarian with the dedication of someone having sat in a cave for many years and returned to the big city only to find out no one missed him. Here proof of the trickiness of doing things in reverse. The writing is alright but the chess board shows a black square on the right where a white one should have featured. I once won a chess championship on board between Europe and Sydney. It was on our honeymoon after our marriage in Finland and we were lucky to be put on a first class ticket when the original boat we were booked caught fire. Looking back, one wonders why one got involved in a chess competition during a honeymoon as if there weren’t more and better things to do. Well, that’s true. 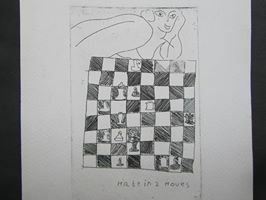 Perhaps the title of the chess game gives a hint. English classes to Greek migrants was also something that was engaged in. The trip was terrific, we danced and drank Italian Suave. This last etching is one I just gleaned from FB and had forgotten about it. I think my good friend Lonia must have that one. http://www.lonia.nl/ Perhaps? It seems to have a distinct Greek theme. I’ll let you readers figure it all out. Yes, I remember an exhibition of Bill Henson being closed down and his work taken by police. However, they were returned and no charges were laid. It reminded me of the treatment Eugene Goossens received decades ago.http://en.wikipedia.org/wiki/Eugene_Aynsley_Goossens He never returned. Now the main entrance to the Opera House is named after him. Some people see evil where there is none except within their cloistered mind. Yes I thought I had seen these or some before. 🙂 We like to tell our stories severally and reveal ourselves. Gez, viewing this device of writing words alongside images I think to ask what you know of this in contemporary art? is there an historical thread of this form of expression, naive, primitive, call it what we might like or represented by what artists? I’ve loved these the first time round. You have a better memory than me Viv. I knew sometimes I recycle a bit. Thank you for your response. Endless patience for anything that encourages me to sit and look at paintings, drawings, doodlings, etchings …and your post seems timely in view of having watched the programme earlier tonight on ABC about the days of Aunty ABC when it apologised for a swivelling belly button owned by a bikini-clad woman. Not sure exactly what it apologised for. Days were any depiction of the naked body or parts thereof that were contemporary was excuse by authorities to close down art shows so as to close down gatherings of people attending them. So many seem to have forgotten the imperative to paint, etch, draw, doodle, etch doodles. Pacific doodles. Seems a title for an exhibition in one of the cities on the east coast of Australia really. Seems there are not so many doodles shown. Doodling is discouraged. It all seems a contradiction in terms almost. 🙂 Thank you Gez for the entertainment …and a great image maker in words you are of family.